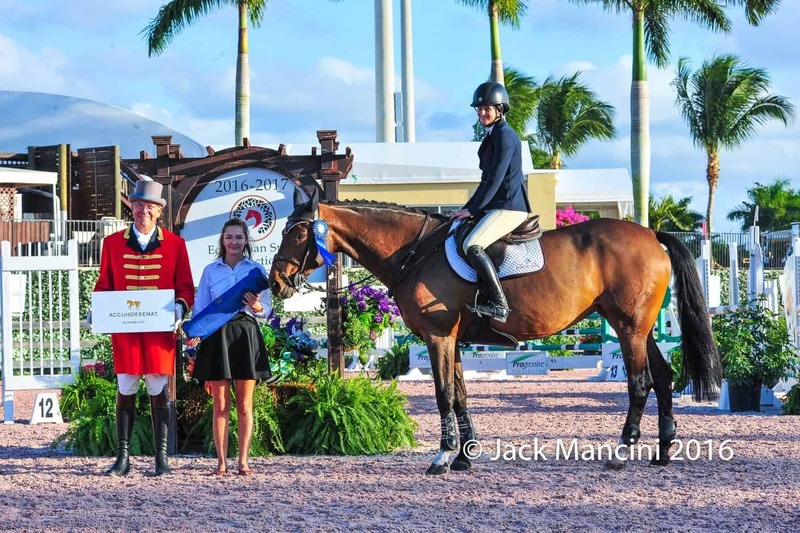 , Saturday, December 17, 2016 — Wellington, FL (December 16, 2016) – Lindsey Tomeu and her 15-year-old Belgian Warmblood, Bonapart, can typically be found on the entry list at the most prestigious jumper shows on the U.S. east coast. Just in 2016 alone, Tomeu, who is from Wellington, Florida, has successfully competed at the Winter Equestrian Festival in Wellington, the Longines Global Champions Tour in Miami Beach, Florida, the Devon Horse Show in Devon, Pennsylvania, the Hampton Classic in Bridgehampton, New York, the American Gold Cup in North Salem, New York, and the Washington International Horse Show in Washington, D.C., as well as shows in Michigan, North Carolina, and Kentucky. Tomeu trains with Shane and Allison Sweetnam and Michael DelFiandra at Sweet Oak Farm. “This is my third summer with Bonapart,” said Tomeu. “He’s a bit quirky, but that’s what makes him try so hard to win. He’s my horse of a lifetime.” Their most recent win was the first Accuhorsemat Adult Jumper Class at the Holiday & Horses show in the ESP Holiday Circuit on December 2, 2016. Accuhorsemat is the title sponsor of the entire Adult Jumper Division throughout the ESP Holiday Circuit in Wellington, Florida, which includes six different horse shows that run through January 8, 2017. Accuhorsemat, distributed in North America by the company Acuswede, is an innovative equine acupressure blanket that reduces tension and soreness in horses to improve mobility, performance, and overall health. Acuswede knows that preparing for and competing in horse shows can be a stressful experience for trainers, riders, and their equine partners— so the company was happy to reward Tomeu for her victory in the Adult Jumper Division by providing her with her own stress-relieving Acuswedemat (an acupressure mat for people). “I’m really interested to try this Acuswedemat, because I definitely get back pain from so much riding,” Tomeu said. The Acuswedemat takes acupressure to a new level, combining classic acupressure and Swedish innovation into a portable mat that applies pressure to multiple points in the body. Using the Acuswedemat regularly increases circulation and accelerates muscle recovery and healing, as well as activates the body’s natural endorphins to create an overall feeling of well-being. Tomeu is eager to try out her new prize. “If I like the Acuswedemat, I’d end up getting Bonapart an Accuhorsemat for sure in the future,” she said. “The main thing I try to do for Bonapart is to keep him relaxed.” The Accuhorsemat increases blood flow and actively assists horses in removing tension in connective tissue by stimulating key acupressure points, as has been demonstrated in a Thermography study. The Accuhorsemat can be used before riding to assist with warm-up, after riding to accelerate muscle recovery, and in between massage/chiropractor/acupuncture sessions to maintain mobility and overall health. Originally developed in Sweden, the blankets for performance horses – and now the mats for people, as well – are quickly spreading in popularity throughout North America. Acuswede is proud to continue supporting equestrian competition through its sponsorship of the ESP Holiday Circuit for hunters and jumpers this season. Photo: Lindsey Tomeu won the Accuhorsemat Adult Jumper Class at the Holiday & Horses show in the ESP Holiday Circuit in Wellington, Florida (Photo courtesy of Jack Mancini).